Your “Yes” to Cash means “No” to tax benefits!!! Let’s discuss each of them in detail. To illustrate with an example, let us assume a taxpayer has incurred an expenditure of INR 25,000. The taxpayer makes separate payments of INR 5,000, INR 5,000, and INR 10,000 all by cash, to the person concerned in a single day. The aggregate amount of payment made to a person in a day, in this case, is INR 20,000. Under the existing law, INR 25,000 is allowable expenditure as the cash payments are within INR 20,000 threshold. However, same will be disallowed under proposed law as the payments in cash exceeds INR 10,000 threshold. The story does not end here. Sub-section (3A) of section 40A provides for deeming a payment as profits and gains of business of profession if the expenditure is incurred in a particular year but the payment is made in any subsequent year of a sum exceeding twenty thousand rupees otherwise than by an account payee cheque drawn on a bank or account payee bank draft. This INR 20,000 threshold is also reduced to INR 10,000. Continuing with above example, let us assume that payment in respect of such expenditure is made next year. In the year of expenditure, the taxpayer claimed deduction of expense on accrual basis. Next year, the taxpayer makes separate payments of INR 5,000, INR 5,000, and INR 10,000 all by cash, to the person concerned in a single day. The aggregate amount of payment made to a person in a day, in this case, is INR 20,000. Under the existing law, INR 20,000 is well below the threshold and hence, there is no deeming profit. However, under the proposed law, threshold of INR 10,000 will be crossed and hence, INR 25,000 will be deemed to be profit and gains of business and taxed. These amendments will take effect from 1st April, 2018 and will, accordingly, apply in relation to the assessment year 2018- 19 and subsequent years. It is further proposed to provide that the said restriction shall not apply to Government, any banking company, post office savings bank or co-operative bank. Transactions of the nature referred to in section 269SS (which covers loans and deposits) are proposed to be excluded from the scope of the said section. Recently, The Government has proposed to lower the threshold of INR 3 lacs to INR 2 lacs. The nature of receipt is irrelevant here. Whether it is an exempt income or taxable income or whether it is a business receipt or a personal receipt, it has to go through Section 269ST test. The allowed modes of payment are account payee cheque or account payee bank draft or use of electronic clearing system through a bank account. Literal interpretation means that not just cash, any mode (e.g. wallets) other than these 3 as mentioned might attract 269ST screening. Violation of Section 269ST would mean levy of penalty equal to 100% of cash received. The penalty is proposed to be levied by inserting new section 271DA. The said penalty shall however not be levied if the person proves that there were “good and sufficient reasons” for such contravention as opposed to “reasonable reason” in other penalty provisions. Please note that it is also proposed to consequentially amend the provisions of section 206C to omit the provision relating to tax collection at source at the rate of 1% of sale consideration on cash sale of Jewellery exceeding INR 5 Lac. Section 44AD of the Act, inter-alia, provides for a presumptive income scheme in case of eligible assesses carrying out eligible businesses. Eligible assessees under the provisions of section 44AD are resident assessee who is an Individual, Hindu Undivided Family and Partnership Firm but not LLPs. 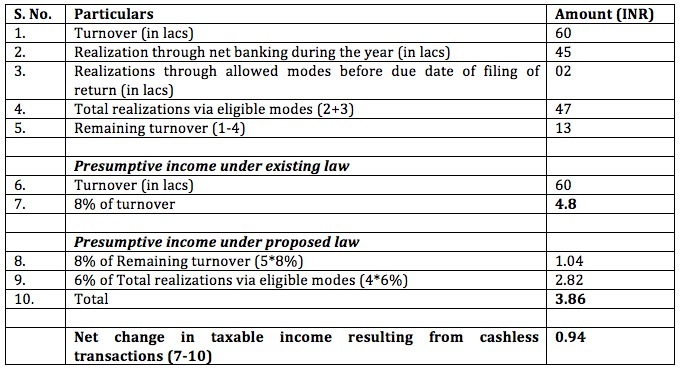 Under this scheme, in case of an eligible assessee engaged in eligible business having total turnover or gross receipts not exceeding two crore rupees in a previous year, he can opt for presumptive taxation and income will be computed at the rate of 8% of the total turnover or gross receipts. The assessee can also declare a sum higher or lower than the aforesaid sum in his return of income, latter being subject to additional requirements. Budget 2017-18 has proposed to amend section 44AD of the Act to reduce the existing rate of deemed total income of 8%. to 6% in respect of the amount of such total turnover or gross receipts received by an account payee cheque or account payee bank draft or use of electronic clearing system through a bank account during the previous year or before the due date specified in sub-section (1) of section 139 in respect of that previous year. However, the existing rate of deemed profit of 8% referred to in section 44AD of the Act, shall continue to apply in respect of total turnover or gross receipts received in any other mode. This amendment will take effect from 1st April, 2017 and will, accordingly, apply in relation to the assessment year 2017-18 and subsequent years. Section 80G provides deduction from gross total income (GTI) in respect of donations made to prescribed funds subject to some conditions. The conditions, inter alia, include that donation exceeding INR 10,000, to qualify for deduction, must be paid by any mode other than cash. Budget 2017-18 has proposed to amend section 80G so lower this threshold from INR 10,000 to INR 2,000. Accordingly, no deduction shall be allowed under the section 80G in respect of donation of any sum exceeding INR 2,000 unless such sum is paid by any mode other than cash. Say, for example, Shekhar donates INR 5,000 to Prime Minister’s National Relief Fund in cash. Under existing section, INR 5,000 is allowable as deduction from GTI while it will get disallowed under proposed amended section 80G if the mode of payment is cash. The proposed amendment, if notified, will take effect from 1st April, 2018 and will, accordingly, apply in relation to the assessment year 2018-19 and subsequent years. There is no provision under the existing law to disallow the capital expenditure incurred in cash. To discourage cash transactions for capital expenditures, Budget 2017-18 has proposed to amend the provisions of section 43 of the Act. Section 43 contains the definition of “actual cost” to be used for interpretation while computing income under the head “profit and gains from business and profession” from sections 28 to 42. Amended Section 43 provides that where an assessee incurs any expenditure for acquisition of any asset in respect which a payment or aggregate of payments made to a person in a day, otherwise than by an account payee cheque drawn on a bank or account payee bank draft or use of electronic clearing system through a bank account, exceeds INR 10,000, such expenditure shall be ignored for the purposes of determination of actual cost of such asset. This means any capital expenditure in respect of which cash payments, whether single or multiple, in a day exceeds INR 10,000 shall not considered in actual cost of the asset. “Actual cost” is widely used under section 32 which provides for deduction for depreciation. The amendment would mean a loss of depreciation expense on such component of cost of asset. For example, let us assume that a company XYZ purchases machinery worth INR 80,000 on July 8, 2017. Payment of INR 20,000 was made in cash and rest was paid by cheque on July 10. As per proposed amendment, the actual cost under Section 43 for such machinery will be NIL and depreciation will also be NIL. Section 13A of the Act, inter-alia provides that political parties that are registered with the Election Commission of India (ECI), are exempt from paying income-tax. To avail the exemption, the political parties are required to submit a report to the ECI before due date of return filing as mandated under sub-section (3) of section 29C of the Representation of the People Act, 1951 ( 43 of 1951). The report, inter alia includes the details of contributions received by a political party in excess of INR 20,000 from any person. Filing of the return is not a condition precedent for availing exemption under the said section, leaving no transparency in sourcing of funds. However, under existing provisions of the Act, there is no restriction of receipt of any amount of donation in cash by a political party. To avail exemption, a political party shall not receive donations of INR 2000/- or more in any mode otherwise than by an account payee cheque drawn on a bank or an account payee bank draft or use of electronic clearing system through a bank account or through electoral bond. Political party must furnish a return of income for the previous year in accordance with the provisions of sub-section (4B) of section 139 on or before the due date under section 139. The political parties shall not be required to furnish the name and address of the donors who contribute by way of electoral bond. This amendment will take effect from 1st April, 2018 and will, accordingly, apply in relation to assessment year 2018-19 and subsequent years. Section 35AD of the Act provides investment linked deduction in respect of capital expenditure incurred, wholly or exclusively for the purposes of business, during the previous year for a “specified business” except capital expenditure incurred for acquisition of any land or goodwill or financial instrument. For example, a company XYZ is engaged in specified business of production of fertilizers. It purchases machinery worth INR 100,000 on July 8, 2017. Payment of INR 20,000 was made in cash and rest was paid by cheque on July 10. As per proposed amendment, no deduction shall be available in respect of such machinery as cash payments in a day exceeded INR 10,000. These proposed amendments mean that we need to be careful at the time of dealing in cash, both at the time of receipt as well as the payment. 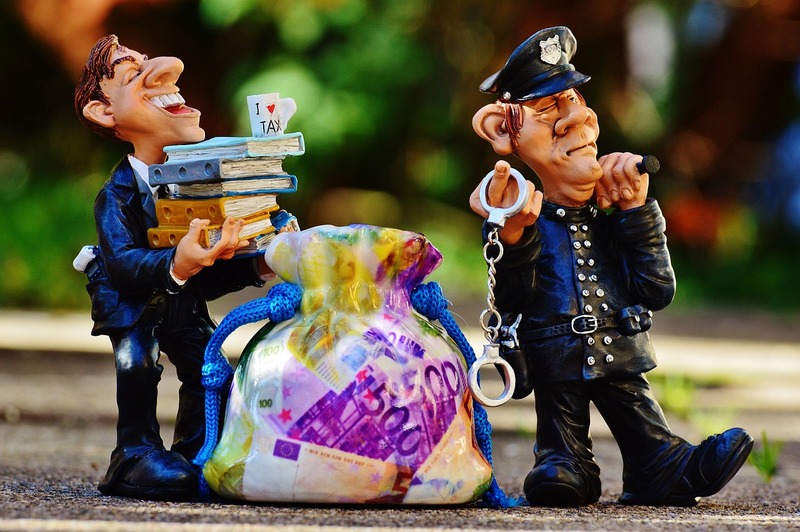 There is an utmost need for check on cash limits at the transaction level, per day level as well as party to avoid losing tax benefits as well as avoiding any penalty and prosecution. And yes, Go digital!